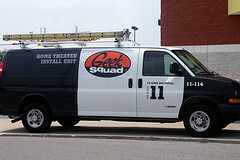 Geek Squad Too Geeky For Target? Back in October, we told you about Best Buy and Target experimenting with putting Geek Squad dorks behind the counter at a handful of Target stores. Shock horror, this didn’t really shake things up at either retailer, so they have decided to just go their separate ways and then maybe occasionally say hi in the hallway between class before eventually deciding it’s easier to just pretend they never went on those couple of awkward dates. The Minneapolis Star-Tribune, which is like the school newspaper editor who has been watching this brief, failed love affair from a distance, reports that the breakup puts an end to the 29-store, six-month experiment — intended to improve Target’s electronics department while bolstering the public brand of Geek Squad. The romance actually first took root in August of last year, shortly before CEO Hubert Joly stepped into his role as Blue Shirt In Chief, a title we just made up but we hope actually exists.